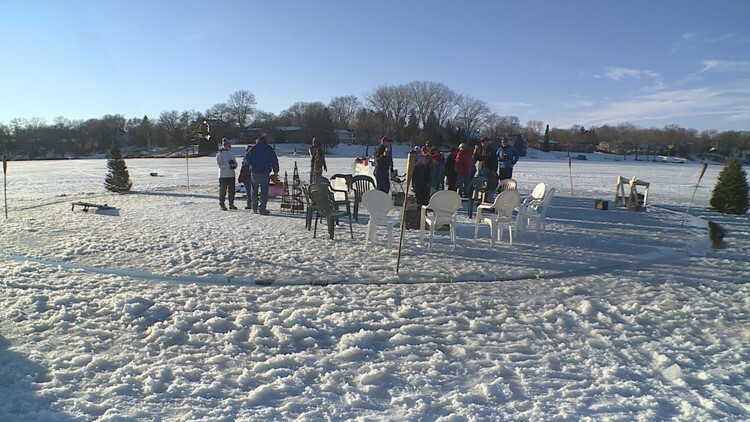 LITTLE FALLS, Minn. — Minnesotans are used to making circles in the ice. Most are small and drilled for catching fish. But lately our winter circles have been getting an upgrade. “Fingers crossed,” says Chuck Zwilling as he surveys the first cuts in what he hopes will be the world’s largest ice carousel. Zwilling first saw an ice carousel two winters ago on YouTube. 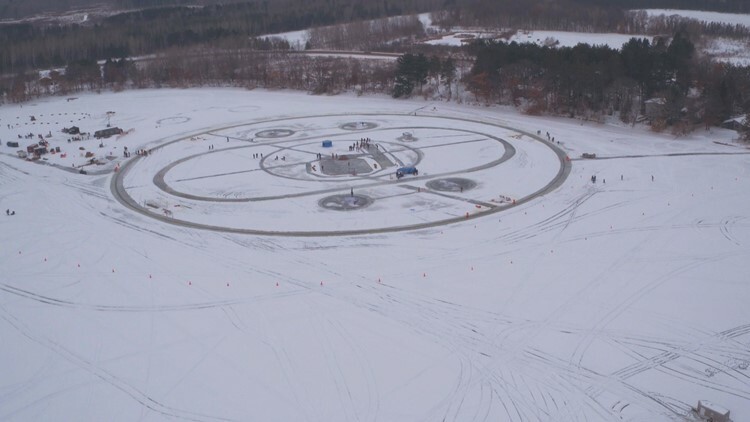 Janne Käpylehto of Finland cut a merry-go-round sized circle in the ice, viewed online by hundreds of thousands of people who smiled and went back to their lives. 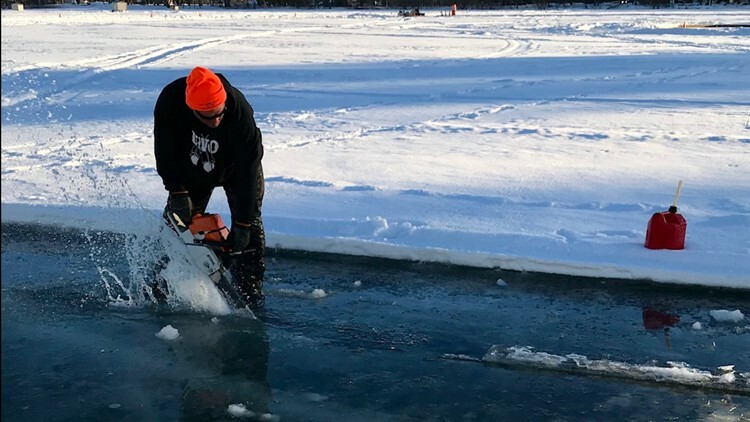 “We've got about eight feet done, only 1,342 feet to go,” said Chuck, now slicing into the ice with a chain saw on Green Prairie Fish Lake. Chuck Zwilling cuts part of the circle for the world-record-setting ice carousel. Chuck’s vision: an ice carousel roughly a quarter-mile around, the largest ever built in the world. This is not his first attempt. Chuck’s first try at a world record last year earned him the title, but not in the way Chuck wanted. 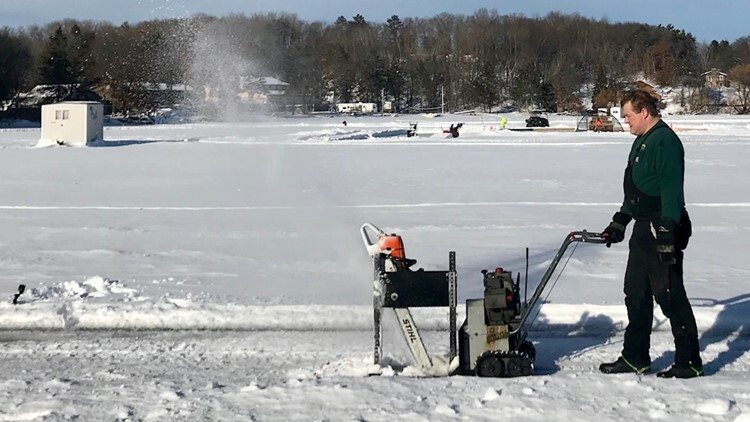 A quarter turn was all Chuck’s carousel could muster after two jury-rigged cutting machines failed and a skid steer broke through the ice. Bo Meyer helps cut the ice for the world-record-setting ice carousel. And what do you know? This year, it did. On a January Saturday, hundreds of people stepped across the nine-inch gap onto the Zwilling family ice carousel. Propelled by four trolling motors, the Zwilling ice carousel spun in a circle for several hours, until winds picked up and pushed it out of kilter. But not before Chuck had achieved his goal: world’s largest ice carousel. 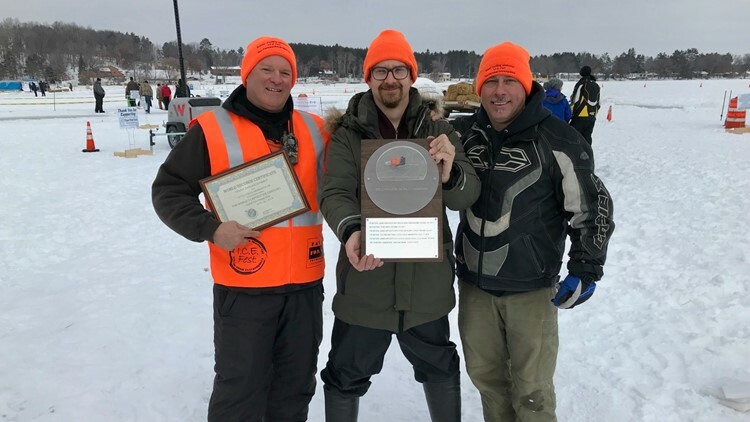 The Finn, Janne Käpylehto – chairman of the World Ice Carousel Association - traveled to Minnesota to measure and certify Chuck’s creation as the new world record holder. Chuck Zwilling (left) builder of the new world-record-setting ice carousel. Pictured with Janne Käpylehto (center) and Roger Morneault, both previous world record holders. Also making the trip: Roger Morneault of Maine, who broke the record with his own sprawling ice carousel last year. Final measurement for Chuck’s carousel: 508 feet across – enough to easily break Roger’s record. “This is the trophy,” said Roger as he walked the metal suitcase containing the prize across the ice. “It's surely going to bring a gigantic smile to his face and an even larger frown to mine to have to turn it over,” said Roger, shedding fake tears. Janne Käpylehto of Finland renewed interest in ice carousels with a YouTube post two years ago. The competition has come far since Janne posted that first online video two years ago. In doing so, he brought back an old Finnish tradition. “One hundred years ago in Finland there have been ice carousels, but it was basically forgotten,” Janne said. But the Finns of a century ago, could not have imagined the good-natured one-ups-man-ship now taking place between people like Janne and Roger and Chuck – each of whom have claimed the traveling trophy. Chuck’s carousel was large enough to host within it, a hockey rink, a curling sheet and a speed skating track – plus several smaller ice carousels within the larger one. The record-setting Zwilling ice carousel in Little Falls, Minnesota. The effort helped raise $15,000 for Flyer Pride Pack, a weekend food backpack program for children in the Little Falls area. As much as Chuck enjoyed raising the money, he also enjoyed raising a few spirits. “Yep, add a little excitement to the middle of the winter,” he says. 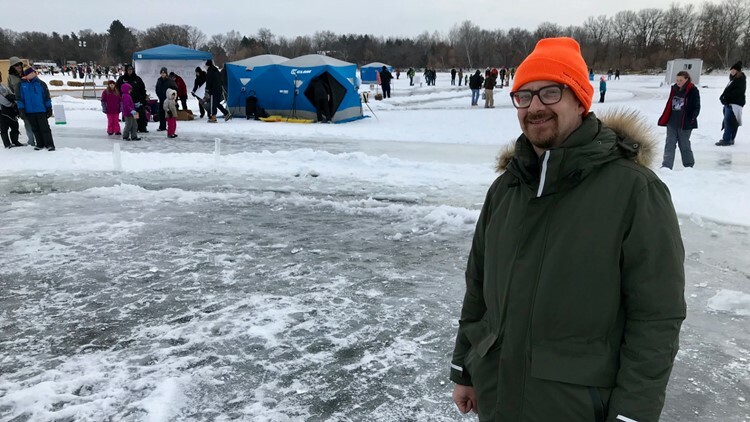 On frozen lakes in Minnesota, it’s just not hip to be square.